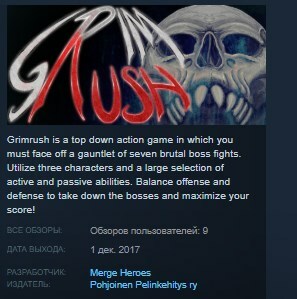 Grimrush is a top down action game in which you must face off a gauntlet of seven brutal boss fights. Balance offense and defense to take down the bosses and maximize your score! A whole load of abilities for each character. Seven intense and wildly different boss battles. In depth scoring system and leaderboards. Choose your character, primary ability and enter the gauntlet. The order of the bosses is randomized each time. After defeating a boss you can choose an additional active or passive ability out of four random ones provided that can be rerolled twice for a bit of control over the randomness. Accumulate and sustain combos to increase your attack damage, perform perfect dodges to recover mana and avoid damage to not die! These things also increase your score. As the abilities given on each run are randomized, you must adapt your playstyle accordingly.